Our team this year was small with only 10 people and 3 dentists, but we were able to do great things. We spent 3 days providing dental care for a few villages around Santa Cruz, Alta Verapaz. We spent one morning visiting the Hospital Nacional de Coban to hand out newborn kits to the new babies and also to give toys and blankets to those in pediatrics. Many of the team members helped buy medicine for a special little girl who was blind and had other health issues. She was 2 years old and had been living in the care of the hospital. During our week we were able to help out a family in Valparaiso who had lost their home and had no food. We provided some food and a few household items for them. This was a trip filled with a variety of opportunities to serve. The team left with a greater gratitude on life and a willingness to serve more in the future. Other photos and stories can be found on the facebook page Satina created for our team trips: www.facebook.com/smilesforguatemala. Today we traveled to Guatemala. We went to the Lifting Generations school in Guatemala City to see how they do mentoring and to learn a little more about their foundation. They are adults who are working to lift themselves and their families out of poverty. It’s an amazing foundation that is doing a lot of good and we were happy to help by providing dental services that day. We saw 52 patients and did 36 fillings, 12 extractions, and 15 exams with fluoride treatments. We went shopping for supplies and took the rest of the day off. After church, we traveled by bus to the Tactic area and organized our supplies. We went to Tactic where the community had a system set up for patient flow. We were working on employees of the municipality and their families. We had some people who had come down from the aldeas in the afternoon. We met the congressman for the area. He was very kind, charismatic, and giving. He would like to have a good relationship with us so that we will come back to this area to help the people here. It was a great facility with lots of room to control the crowds and for us to work comfortably. We had 126 patients and did 100 fillings and 185 extractions. Today we had a line of people waiting when we arrived in the little area of Pasmolón. Many of the people in the village speak Pokomche, so we had two people who consistently helped us communicate any issues. We were still able to use our Spanish with many of the people there. It was a very busy day. After lunch we stopped doing fillings because the line was growing quicker than we were taking it down. We were able to see many more people at that point. We had 227 patients and did 50 fillings and 395 extractions. Today found us with another line of people waiting for treatment in Chacal. We were up the mountainside, outside of Tactic. We set up in a brand new school that had been finished for only a month. We had 183 patients and did 21 fillings and 321 extractions. Today’s village was at least an hour up the mountain in the back of a loaded truck. The bags of blankets, toys, and hygiene kits made for comfortable seating en route. It was spectacular country, absolutely beautiful. We set up in a medical clinic in the village of Chacalte. It was tight quarters in there, but it was sufficient for what we were doing. They spoke Amche. The village had a nurse who helped us with translation. As with all the previous days in the week, the municipality had sent interns to help us out. We were so impressed with all the support and help that they gave us all week long. They helped with transporting equipment, translating, and did any task we asked of them. It was wonderful to have such support and assistance. We were able to see everyone who wanted to be seen that day. We finished up early, in time to go to a dinner that the municipality put on for us. We had 137 patients and did 39 fillings and 224 extractions. Today, Antonio took our equipment back to the city while Karla and the congressman took us to a place called Semuc Champey. It was spectacular. We went on a vertical hike and they had sandwiches for us. We enjoyed swimming in the pools afterward. The only drawback to the day was the amount of time we spent in travel. It was midnight when we returned to the city. I think it was worth it. It was a spectacular place. We made it home!! It was a wonderful trip. repairs, fat transfers for scars, frenulectomies, mass excisions, adhesion releases, hairy nevus serial excision. The team traveled to small villages and built very modest homes from wood, aluminum, and cinderblock. Home 1-songle mom named Victoria with 4 small children. Home 2-single mom named Jesusa with 3 small children. Home 3- widow named Olympia with 3 small girls. She farms the land she lives on growing beans and corn working from 7 to 4 everyday. She makes about $5 a day and has to pay all her expenses and feed her family. Her previous home had no electricity or running water. Home 4- S.C. Peres family. Home 5- M. Lopez family. Home 6- J. Perez family. Home 7-M. Vius family. Home 8- young family with 2 kids. Home 9- Single mom with 3 little kids. We gave the kids some toys and the little boy was so excited he was shaking. The mom said they had never had a new toy before. Home 10- Suzzana as single mom with 4 young kids. She works in the fields close by harvesting corn & beans. Home 11- Single mom with 2 kids ages 9 and 11. her husband died and she has been living in her brother’s house for about a year. Home 12- Elisa G a single mom with 3 girls ages 3, 8, and 17. Home 13- Petrona, a single mom with 2 kids ages 5 and 9. Home 14-Mijias family, a husband, wife, and daughter who has 3 children. Senore Mijias had a stroke 8 years ago that paralyzed the left side of his body and he hasn’t been able to work. They have been living with a friend for years. They are very thrilled to now have their own home. Trip notes: This was the first trip to Peru by a Hirsche Smiles Foundation team. The team flew to Lima and then took about an hour flight to Tarapoto. They then went by vans to Yurimaguas which is 2-3 hours away through windy roads. To say they were windy is an understatement!! As we arrived in the town of Yurimaguas it was like stepping back in time 75 years. Hardly any cars, only motor taxis. We set up in a school using the kindergarten room. So we only had small chairs and dirt floors. Within 30 minutes of setting up ….we realized we were in trouble. It was so incredibly hot and humid!!! Everyone was dripping with sweat and so hot. I ended up sending my son Jesse out on a motor taxi with money to find some fans. Hilda was good to keep water/juice coming every 30 minutes so we didn’t dehydrate. By it was so exhausting. The poor dentists would work on a patient then take a break for 5 minutes in between them. I can’t express enough how hot, humid and exhausting that day was! Another day, we arrived to the location where we had planned to work, but Lance found that is was way too small for us and dark…so he started walking around looking for another place. Some local man offered his place. The front part of his house, which is roughly the size of your living room and is surrounded by an old fence. Lance said the space is fine but would be hard to use with the fence surrounding it. The man quickly grabbed some friends and took the fence down!! Incredibly kind! And yes he offered his bathroom. We can’t express how kind these Peruvian people are. They literally open their homes to our team. Our statistics are as follows. Trip Summary: The “Wyoming Team” recently returned from our annual dental trip. We are happy to report that all went very well with our trip. Everyone remained safe and healthy throughout the duration of the trip. We were also able to visit several schools where we did many exams and provided oral hygiene instructions. We gave away many toothbrushes and hygiene kits on these school visits. In addition to the dental work we were able to deliver 750 lbs of donated humanitarian aid to those we served. Humanitarian goods included the following: blankets, toys, hats, newborn kits, hygiene kits, socks, soccer jerseys, and soccer balls. There were many people that benefited from these donated services. The donations came from many sources. We had eagle scout projects, young woman projects, relief society projects, and community members that on a daily basis stop by to donate goods. The soccer jerseys and balls were donated by the Evanston High School girls soccer team.. Dental work completed: 322 patients, 533 extractions. This was the first year we, Nathan and Satina Tolman, organized a dental/humanitarian trip. We had met Greg Jensen from the Mayan Eco Homestead a couple years ago and appreciated his mission. We have enjoyed serving the people in the dental capacity but wanted to something more. We combined 3 days of dental work with 1 day of building garden boxes for the individuals that have completed the program at the Mayan Eco Homestead. We had a team of 15 and the two of us were the only ones that had been on a dental trip before. We were nervous about how it would work with such a new team and working with Greg who has never done a dental mission before either. We were very pleased that everything turned out extremely well and we feel it was a huge success. We look forward to taking more teams down in the future and doing the same type of combined dental/humanitarian missions. Guatemalan Participant List: Include on-site hosts/helpers and contact information for each person. In addition to our dental work, we delivered 507 white shirts to the Mormon Missionaries who are native Central Americans. Also, we are supporting a young girl in her school. Her dad can’t support all of his children in school so “Since she is a girl and girls don’t need an education”, she is the child who had to drop out. We have paid for two years of school so that she can finish high school. She still lacks two more years. On this visit she was crying a happy cry. Because she is in school, the students voted her to participate in the pueblo queen contest. 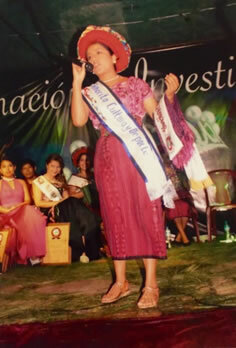 She won and is now the queen of the pueblo. She has many opportunities to address young people of the pueblo. She tells them, “If you educate a man, you educate a man. If you educate a woman, you educate a generation”. Trip Statistics: 90 patients were screened, 71 patients had 82 surgical procedures that included 37 Cleft related procedures such as cleft lip repairs, cleft palate repairs, palate and nasolabial fistula repairs, rhinoplasties, and septoplasties. 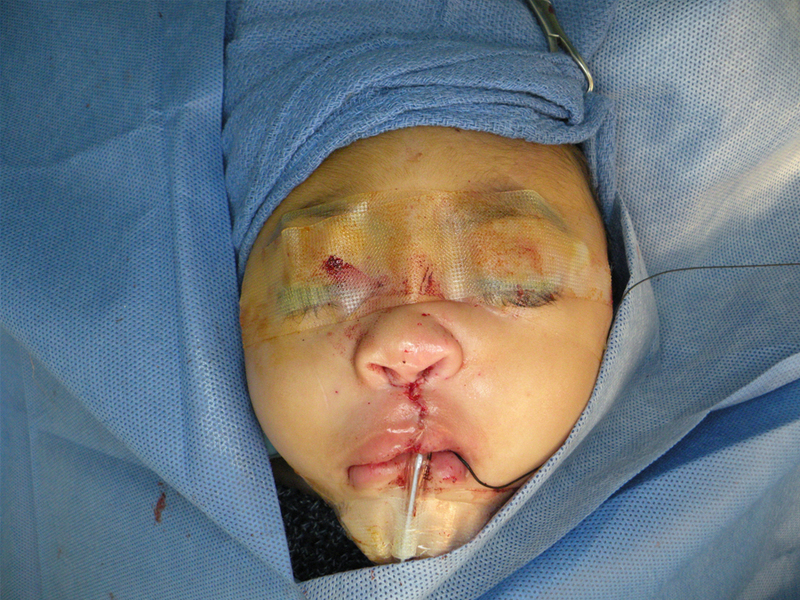 Non cleft-related procedures included burn scar revisions, ear procedures such as microtia repair and otoplasties, facial injury scar revisions, orbit of eye reconstruction with canthopexy, frenulectomies, excisions of miscellaneous cysts and pylomatrixomas, excision of a supranumery thumb, excisions of accessory tragus and auricular skin tags, Excision of hemangiomas, and an excision of a neurofibroma. 11 patients also had dental procedures under general anesthesia. The team had a marvelous mission working with the staff at the Moore Pediatric Surgery Center. Their staff provides wonderful care for our patients and are a pleasure to work with. We are happy to report that all of our patients recovered well from their surgical procedures and will have a better life as a result of our work. We love providing this service to the people of Guatemala. Statistics: 62 patients, 83 procedures 31 of which were cleft related. 15 patients had dental procedures in addition to their surgeries. Procedures included: primary unilateral and bilateral cleft lip repairs, cleft lip revisions, nasolabial fistula repairs, primary cleft palate repairs, microtia repairs, canthoplasty, scar revisions, tonsillectomies, burn scar revisions, rhinoplasties, soft tumor mass excisions, pre-auricular skin tag removal, frenulectomies, excisions of cysts, syndactyly repairs, and otoplasties. The team also provided humanitarian supplies that included blankets, clothing, and toys for the children. Team members: Dr. Larry Braithwaite, Wanda and Alan Corbridge, Dr. Lance Crowther, Kade and Natalie Crowther, Dr. Theron Crowther, Cassidy Fraker, Malana Hansen, Justine Holman, Dr. Bruce Howell, Brette Martinez, Dr. Dan Ormsby, Dr. Glean and Garret Payne, Rebekah Reid, Kathy Ross, Dr. Grant and Jake Stucki, Dr. Nick Young, Laura and Kevin Brewer. The team also gave families tooth brushes, toothpaste, oral hygiene instructions, blankets, clothing, and toys. Locations: Hermanas de Maria Villa de las Ninas- an orphanage in Guatemala City, Momostenango, Las Nubes, Santa Inez, orphanage near Quetzaltenango. Statistics: 436 patients, 275 Fillings, 631 extractions plus fluoride treatments,provided toothbrushes, tooth paste and oral hygiene instruction. Humanitarian efforts: Distributed white shirts and ties to LDS missionaries, built chicken coops, and tables for schools. Team Members: Dr.Glen Dean, Dr. Cam Quayle, Mandee Quayle, Dr. Marcus Pope, Turia Pope, Dr. Jake Martineau, Dr. John Wood, Logan Wood, Shiloh White, Michelle De La Torre, Cimmy Starr, Lindsey Marsden, Skylar Marsden, Missy Woolsey, Scott Christensen, and Teresa Christensen. On this trip we had two pediatric dentists, three general dentists, two coordinators and nine dental assistants. We had two Guatemalan nurses that were to be trained as dental assistants. The Guatemalans all spoke Spanish and T’zutuil–THE ASSISTANTS WERE INVALUABLE WITH THE MAYAN SPEAKING PATIENTS. Humanitarian efforts: We delivered 250 white shirts to the Mormon Missionaries who are native Central Americans. We gave dental equipment, materials and instruments to the Guatemalan Dental Student before and after the mission. This was to help him with a service project plus help him set up a practice. We also gave him soccer balls for a service project. We gave a 2 note pads to ADISA. ADISA is a school for “special needs” persons. We paid for a denture for Rosario Ajuchan Ixbalan. We brought stuffed animals, blankets and dental hygiene kits that were part of eagle scout projects. We made contact with a group of Guatemalan Dentists who will help us on our next jornada. Team Members from the USA: Dr. Glen Dean, Dr. Jeremy John, Dr. Kristy Rogers, Liz Torres, John Starkweather, Xitali Gomez, Eric Lopez,Mary White, Cimmy Starr, Sandra Gutierrez, Daphne Snarr, and Haley Snarr. On this trip we had three pediatric dentists, two coordinators and seven dental assistants. 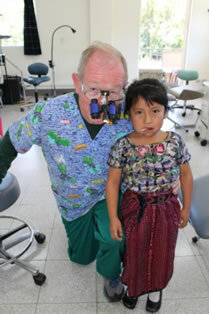 We also had four Guatemalan Dentists and five Guatemalan dental assistants. The Guatemalan dental assistants spoke T’zutuil as well as Spanish. We had one Guatemalan nurse that was to be trained as a dental assistant. She also spoke Spanish and T’zutuil–THE ASSISTANTS WERE INVALUABLE WITH THE MAYAN SPEAKING PATIENTS. 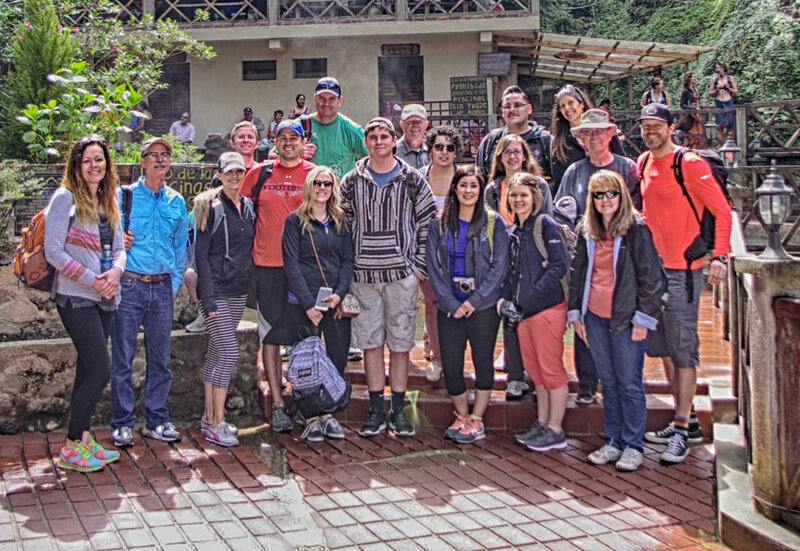 Advance Team: A team of four arrived on the 23rd so they could go to Huehuetenango to visit two hospitals which we might be able to use for missions in subsequent years. One was a national hospital, the other a private hospital. Neither could meet our expectations primarily because of not being able to provide post-op follow up care which would be needed. While in the Huehuetenango area, the team screened several children for surgery to be done in Guatemala City. Antonio Salgurero made all arrangements for the team. The rest of the team arrived on January 26th. We screened 77 children on January 28th and set up the operating rooms. Starting the 29th we had four very busy and rewarding surgical days, performing 53 surgical procedures on 50 patients. Surgeons were Faizi Siddiqi and Ross Blagg- Team 1 and Barbu Gociman-Team 2. Anesthesiologists were Alan R. Patterson, Thayne Wilson, and Michelle Bowlen. Team 1 nurses were Liz Fuller and Jennifer Taylor. Team 2 nurses were Laura Rothe, Sharla Morgan, and Linda Howard. PACU nurses were Julie and Amy Musselman and Krista Bott. Post-op nurses were Margaret Taylor and Wanda Corbridge. Pre-op Nurse was Karen Cardoza, Pediatrician, Moreno Robins and coordinators, Sandi Mangum and Jean Patterson (records). Volunteers were Will Jones, Steve and Karen Mc Arthur and Lola Dawn Wilson. We were fortunate to have a senior pharmacy student from Tennessee, Emily Loveless as part of our team. The Moore Pediatric Surgery Center is a wonderful facility, fully staffed with excellently trained personnel and modern in construction and equipment. We worked very well with center staff and thoroughly enjoyed the week. We have requested that we be able to return to the center during 2015. We will be able to bring three teams and will need fewer ancillary people because the staff at the center is more than adequate in number and training. We commend the Shalom Foundation (Allison Bender), the Moore Pediatric Surgery Center (Maria Jose de Gallardo, Administrator, Dra. Ligia Figueroa, Medical Director, and staff for their cooperation to complete a rewarding and successful mission in 2014. January 29, 2014: Will Jones, Steve McArthur, and Antonio Salguero left the surgical team in Guatemala City and traveled to the Escuintla area to build and revise several homes for needy families. They accomplished a lot of good work in just one day. A few days before the trip, Antonio had purchased supplies and enlisted local volunteers to assist in the work. Locations near Guatemala City, test coast of Guatemala, and Quetzaltenango. Statistics: 930 people were examined, 1769 extractions, 179 fillings. Villages where the work was done: Mixco, Chita, San Juyup, Chirijox, Alaska. Trip Summary: Saturday the team worked in Mixco, near Guatemala City. The project was organized by a young woman from the LDS Church and community leaders. The HSF dental team treated 46 people doing 46 fillings and 27 extractions. Many of the young people had big cavities on their front teeth. We were able to give them a beautiful smile. Monday and Tuesday, the team worked in Chita and San Juyup, near the west coast of Guatemala. The team in San Juyup worked in a school and were able to do extractions and fillings. The Chita team had to climb a steep hill carrying all of their equipment to a community center. They were only able to do extractions. Most of the people being treated were in pain because of the decay and damage in their mouths. One young lady had not been able to eat for a week because the pain in her mouth was too intense. Every tooth was abscessed, decayed, and rotten. Dr. Lester did a full mouth extraction and the girl and her mother were very pleased with the results. Early Wednesday morning the team traveled to the Quetzaltenango to work in the nearby mountainous villages of Chirijox, Xetinamit, and Alaska. One little girl had so much work to be done that the team did half of the work one day and had her come back the next day to do the other half of her mouth. The humanitarian team worked at the Mayan EcoHomestead to complete a home for the caretaker of the facility. The Mayan EcoHomestead teaches the local people how to grow food and create meals that will give them more balanced nutrition. The team traveled back to Guatemala City on Friday and flew homes on Saturday. It was a very successful mission which brought hope and a better smile to 930 people in Guatemala. Summary: The team took care of 57 patients. They did 9 general anesthesia cases, trained six Guatemalans to work as dental assistants, delivered 525 white shirts to the Mormon Missionaries who are native Central American, gave dental materials and instruments to the Guatemalan Dental Student at the end of our mission. and gave a six note pads to the dental assistants. They met with care takers at the ADISA school for those with “special needs” about Fluoride Varnish and its usages in preventing caries. The team also discussed oral care for these physically challenged patients dentistry. Eagle Scout Avery Atzbach of Troop 525, Pine Creek Ward in Colorado Springs made baby blankets for HA as his project. He and friends donated 152 beautiful blankets that will be given to new babies and also the little ones who come for cleft lip surgery. Team members were from Colorado and Utah- Pediatric Dentists: Glen Dean, Derek Kirkham; General Dentist: James Moore; Dental Hygienist: Sharina Simpson; Dental Assistants: Katie Collins, Dani Kirkham, Daylee Kirkham, Viola Montoya, Cimmy Starr, Ciara Star; Coordinator/Humanitarian: Richard Parrish. All team members were from Colorado. We had six Guatemalan dental assistants. The Guatemalans all spoke Spanish and T’zutuil–THE ASSISTANTS WERE INVALUABLE WITH THE MAYAN SPEAKING PATIENTS. The team donated services worth $177,194 if done in the USA. Statistics are as follows. 57 patients examined, 6 Patients without caries, 45 people received oral hygiene instructions, 318 composite fillings, 9 amalgam fillings, 85 extractions, 1 root canal, 99 stainless steel crowns, 15 pulpotomies, 307 x-rays, 5 deep scalings, 57 prophy, 58 fissure sealants, 9 hospital operating room cases. Team members: Pediatric Dentists – Glen Dean and Barney Olsen; General Dentist-Earl Young; Dental Assistants-Chelsea Olsen, Floy Young, Chuck Johnson, Laura Whitehead, Mary White, Shiloh White, and Cimmy Star; Dental Hygienists- Catalina Johnson and Katie Teller; Pre-Dental Student-Brant Whitehead. We also trained six Guatemalan dental assistants. The Guatemalans all spoke Spanish and T’zutuil–THE ASSISTANTS WERE INVALUABLE WITH THE MAYAN SPEAKING PATIENTS. Trip Summary: The team saw 58 patients two of which were done under general anesthesia. In addition to the procedures listed below, the team met with care takers at the ADISA school for those with “special needs” about Fluoride Varnish and its usages in preventing caries. We also discussed oral care for these physically challenged patients dentistry. They delivered 633 white shirts to the Mormon Missionaries who are native Central Americans. They gave dental materials and instruments to the Guatemalan Dental Student at the end of our mission and 4 note pads to ADISA. Statistics: 58 Patients were examined, 8 patients did not have caries, were gave oral hygiene instructions to 49 persons. Procedures done were as follows: 318 composite fillings, 9 amalgam fillings, 85 extractions, 99 stainless steel crowns, 15 pulpectomies, 307 X-rays, 5 deep scalings, 58 examinations, 37 prophylactic treatments, and 2 hospital OR cases. The total of donated dental services was $193,190. February 2013 found us back at the Fundacion Pediatrica Guatemalteca in Guatemala City. The team led by Dr. Alan Patterson and Sandra Mangum, consisted of 4 surgeons, 4 anesthesiologists,3 operating room teams, 1 pediatrician, 4 nurses in Recovery Room, 3 nurses providing pre or post-operative care and education to the patients and their families, a pharmacist, a photographer, a records keeper, and additional support people. We helped 73 patients who underwent 96 procedures. 16 were cleft lip, 30 cleft palate, 12 microtia reconstruction (to correct ear deformities) and other such as syndatyle (fused fingers or toes), polydactyle (extra fingers or toes), burn scar releases, cyst or keloid excisions, and tongue tie releases. Utah/Wyoming Teams: Dr. Nathan Lester and Dr. Dave Prince led a team in March. Dr. Payne and Kathy Ross led a team in September. Our March team connected with a village that had been displaced by a landslide and had significant needs in many areas. While some of the team provided dental services for the village, another part of the team spent time building a chicken coop. This was rewarding because we were able to help them have healthier chickens, and thus more adequate food resources. They could be more self-reliant and healthy because of this small service we were able to provide. The mobility of our teams is a great asset that allows us to provide access to dental care where it would otherwise not be available. We stayed in the town of Panajachel and traveled to the villages of La Victoria, Chuti-estancia, San Andres Semetabaj, Chiuntinamit, and Cujuyuv. We were fortunate to have a great network of local contacts, local leaders and social workers in these villages who organized and aided in our volunteer efforts. Overall, we treated close to 800 people with 1234 extractions, 331 fillings, and other advanced services. Another highlight of the March trip was the unity of our group. We had an amazing team whose first desire was to serve the people of Guatemala. Our guide had arranged for us to visit a market for souvenirs on Thursday, but we had a long line of people as the time to leave got close. As a group we made the decision to stay and see everyone who had a dental need that day. We were the ones to leave that day much better for the interaction that we had with the beautiful, humble, and gracious people of Guatemala. Colorado Teams: Dr. Glen Dean of Grand Junction, Colorado partnered with Hirsche Smiles Foundation and lead two teams this year. He reported the mission of Aug 15-26, 2013. “We had two pediatric dentists, one periodontist, one newspaper reporter, two family members who helped everywhere and six dental assistants. We had seven Guatemalan dental assistants. The Guatemalans all spoke Spanish and T’zutuil. THE ASSISTANTS WERE INVALUABLE WITH THE MAYAN SPEAKING PATIENTS. We met with care takers at the ADISA school for those with “special needs” about Fluoride Varnish and its usages in preventing caries. We also discussed oral care for these physically challenged patients. We took care of 69 patients. Only 4 did not have cavities. We instructed 78 in oral hygiene. If we were to put a value is US dollars of the work we did it would be: $173,630.00 The procedures were as follows: 154 extractions, 74 stainless steel crowns, 17 pulpotomies, 312 s-rays,18 deep scalings, 69 exams, 69 prophylaxis treatments, 85 fissure sealants, and 8 hospital operating room cases. The team, led by Will Jones, traveled to Guatemala in November. They built a house and kitchen for a poor family on the south coast. They traveled to Quiche and built a house for another very poor family. In Nahuala the team helped 4 families to build a new roof and kitchen, another room and chicken coops. In Quetzaltenango the team built a house, fixed up two houses and bought food for 3 families, . They also bought land for very poor family. Back in Guatemala City, the team helped 2 missionaries for the Church of Jesus Christ of Latter-day Saints who needed shoes and clothing to enter the Missionary Training Center the next day. all of our other contributors who helped finance the trip with their donations. See our blog for more details of the mission. We enjoyed working in Retalhuleu and found the hospital administration and staff to be very helpful and contributed greatly to the success of our mission. We can happily report that all of our patients tolerated their procedures well and were able to return home with a new smile. Surgical Team: In February, the surgical team worked at the Hospital Nino Jesus in Guatemala City and was hosted by the Pediatric Foundation of Guatemala with assistance from Fundacion Internacional Para Ninos. Volunteers from the Church of Jesus Christ of Latter-day Saints assisted in finding patients and providing translation help for patients who do not speak English or Spanish. Some families only speak a dialect called Kikchi or Quiche. A trip to Mexico is planned in September. Dental Team: Three dental teams will again return to several areas of Guatemala. Dates are interspersed throughout the year so that more children can be helped. The first dental team of 18 just returned to the US following a successful mission to the Chiquimula area of Guatemala. The humanitarian group brought down about four suitcases of humanitarian supplies which were donated by the Grand Junction Colorado West Stake Primary of the Church of Jesus Christ of Latter-day Saints (LDS or Mormon).Â Some of these supplies were taken to the Quezaltenango area of Guatemala and were given toÂ directors of the Aldea and Escuela Oficial Urbana Mixta de Educacion Especial â€œXelajuâ€–the special needs schoolâ€”to distribute as needed. We also gave some items to Hogar Del Nino Minusvalido and Hermano Perdro orphanage. Hermano Pedro is an orphanage run by the Catholic Church which has children and adults with special needs. The team toured several cities in Guatemala (guatemala city, Quetzaltenango, Panajachel, Solola, Santiago de Atitlan) with the goal of finding areas with dental needs as well as adequate facilities that could be available for HSF dentists to work in. The team consisted of Dr. Glen R. Dean, Kelly Summers, Al Hymas, Don Cleveland, Richard Parrish, and Harold Davis all from Grand Junction, Colorado. The dental team consisted of Dr. Glen R. Dean, Judy Melchor, Melissa Malott, and Cimmy Star of Grand Junction, Colorado. They worked in an orphanage in Quezaltenango.They examined 39 people whose ages ranged from 1 to 64, 31 of which were under the age of 20. All 39 patients received exams, oral hygiene, and x-rays. The dental team provided the following to these patients: 106 white fillings, 58 stainless steel crowns and 54 extractions, and 6 pulp therapies. Both groups were assisted by Antonio Salguero of Guatemala. 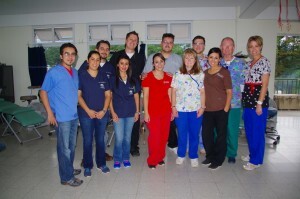 Surgical Team: Our team, consisting of 13 medical volunteers returned to Boca del Rio and Veracruz, Mexico. HSF was hosted by DIF of Boca del Rio and worked at the ISSSTE hospital in Veracruz. We selected 23 patients for surgery and performed 29 procedures which included cleft lip and cleft palate repairs, burn scar contracture releases, frenulectomies, first and second stage microtia repairs, rhinoplasties, and canthalpexies. Surgical Team: Our team returned to Guatemala City. The team worked at the Pediatric Foundation of Guatemala’s Hospital Nino Jesus. Hirsche Smiles Foundation was assisted by Fundacion Internacional para Ninos which is under the direction of Naomi Bronstein. HSF performed operations on 42 needy children. 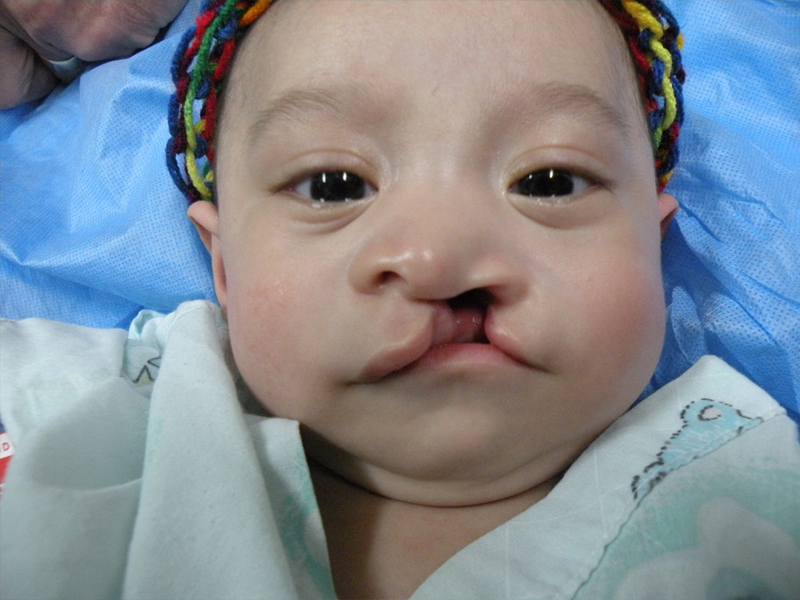 32 of the procedures were cleft lip or cleft palate related repairs. Other procedures included frenulectomies (tongue-tied), burn scar releases, removal of extra fingers and toes, releases of syndactyly (webbed fingers or toes), and otoplasty. Dental Team:The team consisted of only 6 people and a different model was employed. On this trip, we partnered with IGUATE, the government sponsored tourist program that provides transportation and protective activities to foster development and service, as well as the children’s foundation (Fundacion de Desnutrition de los Ninos) through Antonio Salguero. We visited three locations, working approximately two days in each, thus attempting to minimize the set up and take down time.The three locations in which care was provided were: Puerto San Jose, Masatenago, and Queteltenago. 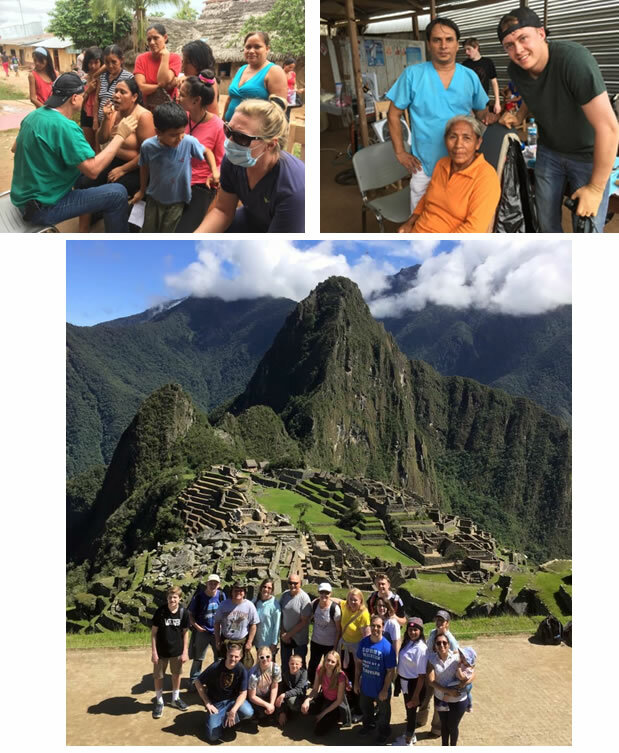 Dental Team: In association with Asorech in Guatemala, the Utah Dental Chapter™ of the Hirsche Smiles Foundation completed a highly successful 9 day service project February 13 through February 22. Success was again measured in the amount of care provided to patients, the operational smoothness of the logistics, and camaraderie developed between the team members during the trip. Over seven hundred and 15 patients (totals do not include the final day of treatment at the Church) received a total of 986 extractions, 377 restorations (primarily in maxillary anterior and permanent molars), 17 sealants, 11 periodontal cleanings and assorted other clinical care. The dollar value of this diagnostic and clinical care, based on conservative Colorado fees, was approximately $260,000. Surgical Team: HSFs surgical team went to Boca del Rio, Veracruz, Mexico. HSF was sponsored by mayor’s office and a government agency called DIF. Dr. Charles H. Stewart of Provo, Utah (DRSTEWARTMD.com) was our plastic surgeon, Alan R. Patterson was the anesthesiologist, and our team leader was Sandra S. Mangum. We performed 31 procedures on 24 patients. 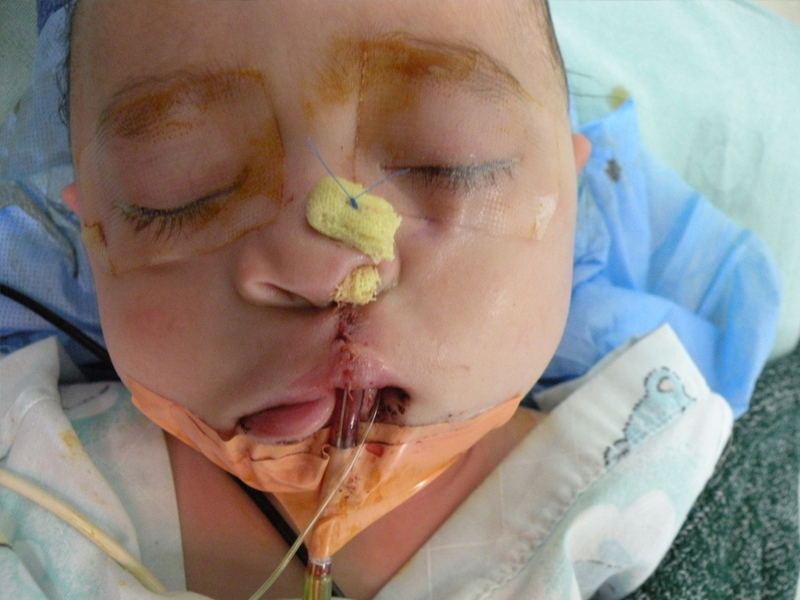 14 cases were cleft-related. Dental Services: HSF dental team returned to Guatemala. The mission leader was Dr. Richard Call from the Denver area. The team was composed of 8 dentist and 8 dental assistants. 552 patients received direct care and hundreds more received screening, dental health education, and oral health materials. Patients receiving direct services were primarily affiliated with the Chorti Indian tribe living in rural isolated mountainous regions of Chiquimula and Zacapa in Eastern Guatemala. Patients able to get to the public hospital in Chiquimula for an intensive one day service project (approximately 120 patients were seen on a Sunday afternoon). Five hundred and fifty-two patients received a total of 850 extractions, 365 restorations (primarily in maxillary anterior and permanent molars), 58 sealants, 85 topical fluoride varnish treatments and assorted other clinical care. The dollar value of this diagnostic and clinical care, based on conservative Colorado fees, was approximately $221,500. Surgical Team: Our team of 24 returned to Guatemala City and worked at the new Hospital Nino Jesus that is operated by the Pediatric Foundation of Guatemala. Our surgeons were Faizi Siddiqi (www.utahplasticsurgery.org), Steven H. Warnock (drstevenwarnock.com,) Galen Perdikis, and Larry Leonard. Anesthesiologists were Alan R. Patterson, C. Thayne Wilson, and Michael Taylor. We performed 60 procedures on 50 patients. 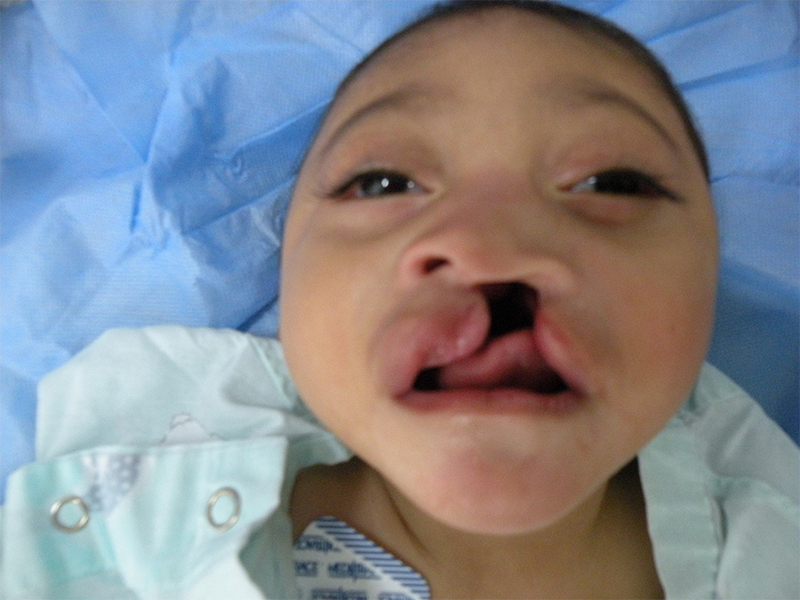 38 procedures were cleft lip or cleft palate related. Most of the funding for this trip was from The Smile Train and the Plastic Surgery Education Foundation. We greatly appreciated the funding we received from them. Surgical Team: A small surgical team of 12-14 people traveled to Cuauhtemoc, Chihuahua, Mexico. The trip was sponsored by the Lion’s Club of Cuauhtemoc. Dr. Charles H. Stewart was our surgeon and Alan R. Patterson the anesthesiologist. We operated on 29 patients who had a wide variety of conditions that required plastic surgery. Dental Team: The team traveled to Guatemala City and then to the Chiquimulilla area. Two teams of 9 traveled in small 4-wheel drive vehicles to remote sites identified and prepared by Asorech, a community development organization (NGO). 681 patients received direct care and hundreds more received screening, dental health education, and oral health materials. Patients received 1,396 extractions, 170 restorations and assorted other clinical care. The dollar value of this diagnostic and clinical care, based on conservative Colorado fees, was $272,890. Surgical Team: Surgeons Faizi Siddiqi, Jed R. Bindrup, and Charles H. Stewart and anesthesiologists along with three complete OR teams and additional recovery room nurses went to Guatemala City. The trip was sponsored by HSF and The Fundacion Pediatrica de Guatemalteca. 54 children received surgical intervention. Two of the children needed complex surgeries and would have had to travel to the United States to receive help had our team not traveled to Guatemala. November 2006-Dr. Charles Stewart and team went to Cuauhtemoc, Chihuahua, Mexico. This is the first time we operated on children with microtia- (a deformity of the outer ear). This is quite an involved operation and consists of taking cartilage from a rib, fashioning an ear out of the cartilage and inserting the form of the ear under the skin where the ear should have been. The 2nd stage surgery willl be done next year. The child looked really great and was happy with his new look. Surgical Team: Our team returned to Cuauhtemoc, Chihuahua, Mexico. For the first time, we were able to help children with microtia- a congenital deformity of the outer ear, as well as patients needing surgery for cleft lips and palates, and other conditions from injuries or birth defects. We performed 25 surgeries for patients who could not afford to pay local plastic surgeons to care for them. 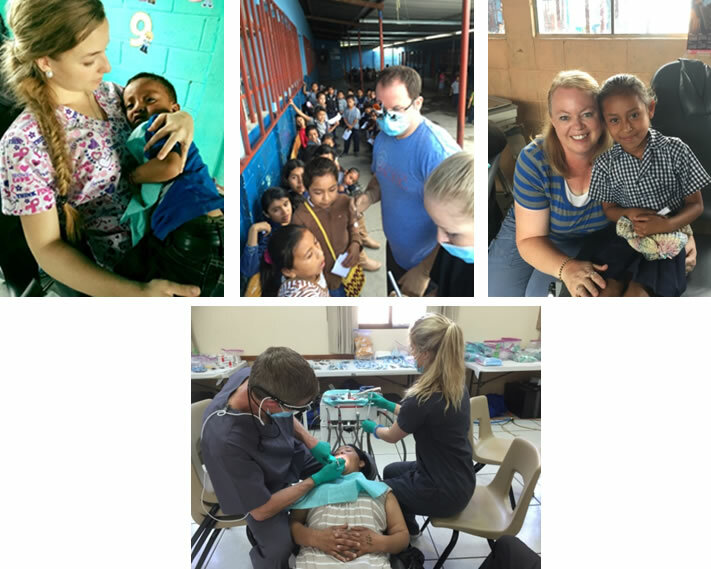 Dental and Surgical teams visited Guatemala with the largest number of volunteers yet. The Dental Team is now able to do dental restorations as well as extractions.Â Donations from local businesses allowed the team to purchase portable dental units and a hand-held x-ray machine. HSF was able to help more people than on previous trips. Surgical Team: Our team was accompanied to Cuauhtemoc, Chihuahua, Mexico by Dr. Robert Rey (Dr. 90210) and a camera crew from the E! Entertainment television channel. Dr. Charles H. Stewart was assisted by Dr. Rey on the procedures that were performed. The TV episode that was filmed is still being broadcast on the E! Entertainment Channel.